Those Romans were on the up and up about a lot of things. They had some mad aquifer skills, their roads were impressive even by today's standards, and their personal hygiene would remain incomparable for a good thousand years after their downfall. How were they able to come up with so many inventions and ideas? While the answer is still up for debate, we have a theory that it had something to do with going pant-less. Good aeration is healthy for the brain, how are you supposed to think when you're overheating? The Roman's knew how to keep their wardrobe simple. Just tie this length of cloth around your body and it's a wrap! Who has time to hit up the mall when you're setting the stage for the future of world warfare, technology, and government? 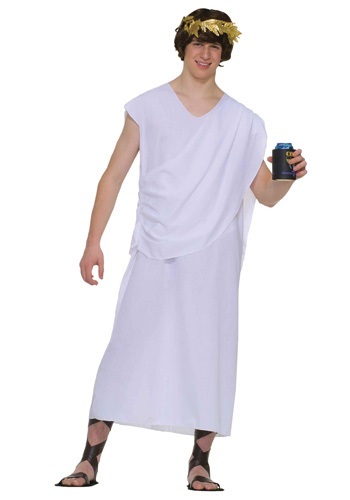 You aren't used to wrapping your own toga so be sure that your clothes aren't going to fall off in the middle of the forum and invest in our toga robe. Just slip it over your head and you're ready for the senate. . . or an Animal House reenactment, whatever you're more comfortable with. Sure, you might not know how to count in Roman numerals and still have trouble remember what those Greek symbols on the fraternity houses mean but that doesn't mean you can't do as the Romans do. Don't worry about showing up to the party wearing the same toga as someone else, then you can use the only Latin you know, "Et Tu, Brute?"